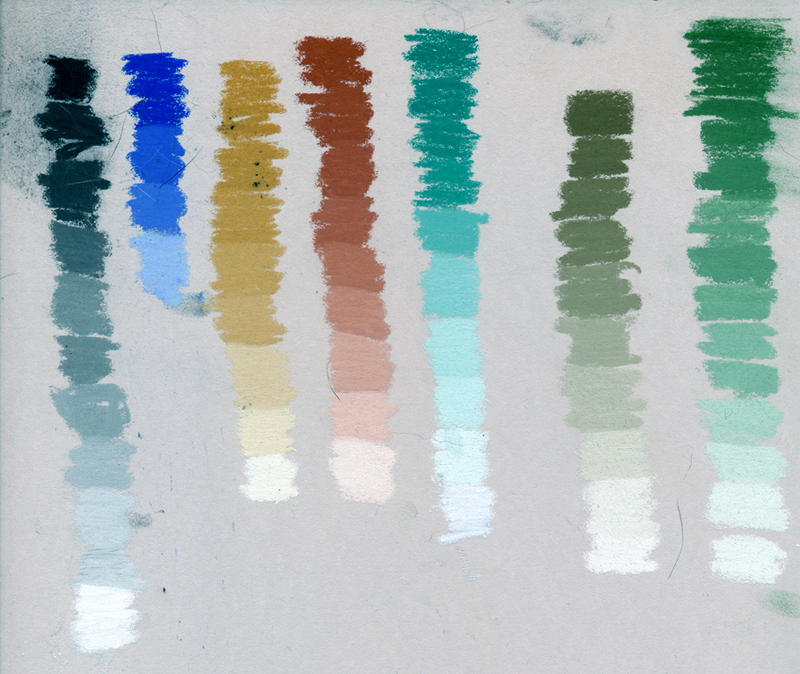 Here's a quick test of the range of each pigment. There is a noticeable difference is hardness among these pastels, and especially noticeable towards the pure pigment end of each set. The yellow ochre and viridian were particularly scratchy. The black iron oxide was very soft, buttery is probably a good analogy, with the sticks breaking up easily. The white was soft and I think that influenced the light side of all the pigments. 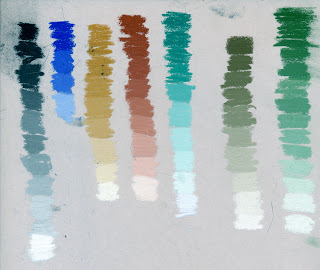 I have noticed those same qualities (hardness vs. softness) in comercially produced pastel sticks as well- I'm sure it is just the nature of the pigments that makes it so. I'll be willing to bet that your binder recipe also comes into play as you will find that brands of pastels are different too- for example, while Rembrandts are uniformly harder than Sennelier which are buttery, they are much softer than Nu-Pastels. All three brands have colors within their ranges that are hard and soft. That's one downside of working in pastel- you can't help but to collect a huge number of not only colors and shades, but degrees of softness and hardness for different applications (i.e. line works vs. shading large areas of flat color). I do hope you get a chance to "play" with your pastels soon and that you have FUN!